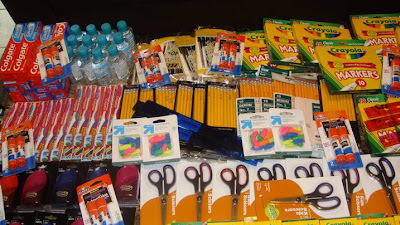 Village View Post: SCHOOL SUPPLIES SHOPPING FOR CROOKED TREE & LEMONAL SCHOOLS!! SCHOOL SUPPLIES SHOPPING FOR CROOKED TREE & LEMONAL SCHOOLS!! This is the last week for you to get your boxes in for the school supplies drive for the Crooked Tree and Lemonal schools!! Those of you with kids know that the list for supplies seems to get longer and longer each year. But we all are smart about school shopping, aren’t we? Well, it’s no surprise that just about everyone is looking for ways to shop smarter. In the most recent Back-to-School Shopping Survey, most parents will be using money-saving techniques to shop this year. Some will be using coupons, some on-line shopping and others will be scouring the Sunday papers for ads and alerts from retailers. Before you go out driving all over town, here is a list of what you can get this week in one stop to be a smart back-to-school shopper. Office Depot: Scholastic school glue-4oz $.01, limit 5; Sharpie permanent marker-$1.00 per 5 pk, limit 3 pks; Paper-Mate erasers-$.50 3 per pk, limit 5 pks. HAPPY SHOPPING: The learners today will be the leaders tomorrow!!! Easy Shipping will be leaving Miami on August 25th, but your package must be in by August 15th. Please remember that if you send your money order to Cherry she can do the shopping for you at no cost. Thank you to: Eddie Melcer, Kaitlyn Kliewer, Lisburn "Nash" Tillett, Jaleesa and Meleesa Leslie; your packages are in good hands! !